There is a new culture in medicine coming down the pipes. Hospital reimbursement, from insurance and the government, is beginning to be affected by patient satisfaction scores. I understand where they are going with this. Somewhere in an office high in the tops of an office building…far, far from patient care…someone was thinking of a utopic hospital where lab results were immediate...radiology tests were read at the bedside and doctors had only one patient at a time. A place where nurses smell like sugar plums and look like angels…A place where pain medicine isn’t needed because anything that ails you can be cured with a smile and the touch of a hand. I, too, want to be treated at this facility. Unfortunately, it doesn’t exist. Hospitals are spending millions of dollars educating staff on how to create the perfect patient experience. Workshops and conferences are serving up scripts for providers to use. Scripting that includes using the words “very good” several times to play mind-tricks on patients so that their robotic response on paper to satisfaction surveys will mimic the words that they heard multiple times during their stay in an ER. The control is in the hands of the patients. Doctors feel forced to order unwarranted tests for patients who have read on WebMD what the path of their ER visit should look like. Nurses take physical, mental, and emotional abuse from patients and visitors in hopes that their monthly Press-Ganey scores will improve. I mean, their raises depend on it after all. It is all smoke and mirrors. Facilities are spending so many financial resources attempting to coach the staff on how to make patients happy. This approach is much like putting Neosporin on an infected wound and covering it with a Band-Aid, all the while not removing the festering splinter causing the infection. All of these efforts are moot if the facility is not doing everything in its power to raise STAFF satisfaction. When you have nurses that feel overworked, underpaid, ignored, undervalued, and disrespected…no amount of training regarding the correct approach to patient satisfaction will work. People who go into healthcare are for the most part, innately kind. They are helpers. They are people pleasers. Making patients happy is second-nature to most of them. Make the nurses happy and everything will fall into place. Have you ever heard the phrase “happy wife…happy life”? If not, it simply means that if a man makes his wife happy, everything else will fall into place. It makes sense, doesn’t it? She will smile as she’s putting away the dishes, folding your laundry, cooking for you…she’s doing it willfully and happily because she loves you and she wants to do it all. On the flip side, however, if a man isn’t making his wife happy, his laundry isn’t being done as well, trips to the store aren’t as frequent, sandwiches are frequently served instead of a hot meal…The same can be applied to nurses. When nurses are paid adequately, given appropriate work loads, and don’t feel taken advantage of, they will absolutely deliver. When they make suggestions to management that are taken to heart and put into action, they will feel supported. When patients aren’t allowed to abuse them, they will feel protected. When their experience is seen clearly and sought out to aid in decision-making processes, they will feel respected. When they are managed under a transparent administration, they will no longer feel paranoid. When they are rewarded for their loyalty, they will feel un-expendable. When doctors see a nurse as more than a “scribe” and instead as an educated person who is either an expert in their field or is striving greatly to become one, amazing things can and will be achieved. 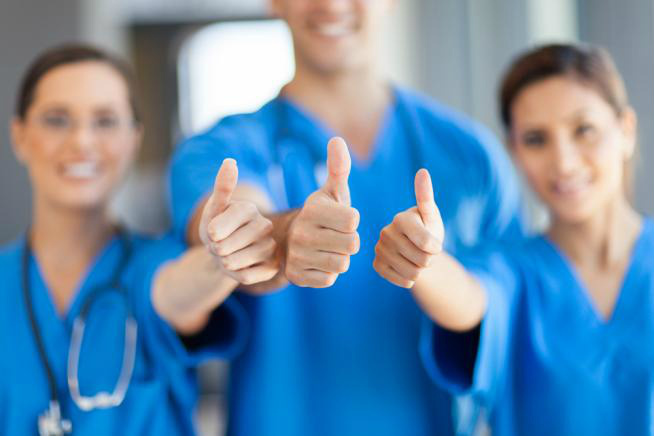 The key to patient satisfaction is nurse satisfaction. Nurse Satisfaction + Patient Satisfaction= Higher Reimbursement… It is a very clear solution. HAPPY NURSE…GREAT BIG PURSE.